Establishing a business in Abu Dhabi typically follows the same key stages, however, there are nuances to be applied to individual business sectors. There are various legal forms that a company in Abu Dhabi can take to include; Limited Liability Company, Branch Office, Representative Trade Office, Professional Service License, Free Zones and Commercial Agent (Exclusive Distributor). A Limited Liability Company (LLC) is the most commonly used vehicle for setting up in the UAE as a foreign investor and is often the only choice for many business activities. A LLC can be formed by a maximum of fifty shareholders whose liability is limited to their shares in the company’s capital. At least 51% of the shares in the company should be owned by UAE National(s) or a 100% owned UAE Company (The Sponsor). 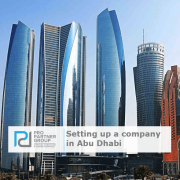 PRO Partner Group facilitates all the procedures and legalities involved in establishing and maintaining a commercial entity in the UAE, from Commercial Registration to Professional Corporate Nominee Services and visas. Having assisted in the formation of over 300 companies in the Middle East, PRO Partner Group enable more businesses to capitalise on the regions prosperous economy. Working Part-Time in the UAE Major Positive update from the UAE government overnight.